Synopsis (from the Goodreads): Unbeknownst to many folks outside the Amish Mennonite population in America, Pinecraft, Florida - a village tucked away in the heart of Sarasota - is the vacation paradise of the Plain People. 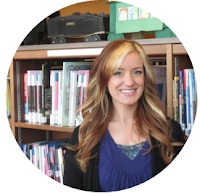 Unlike any other Plain community in the world, this village is a virtual melting pot of Amish and Mennonites from around the world, intermingled with people, like author Sherry Gore’s family, who live there year-round. Gore has put together a cookbook that represents the people who make Pinecraft unique. With hundreds of easy-to-prepare recipes, 16 full-color photographs and black-and-white photographs throughout, this cookbook includes traditional favorites such as Sweet Potato Sweet Mash and Mrs. Byler’s Glazed Donuts, as well as Florida favorites including Fried Alligator Nuggets, Grilled Lime Fish Fillets, and Strawberry Mango Smoothies. Interspersed with the recipes are true-life stories about births, engagements, weddings, deaths, funerals, celebrations, wildlife encounters, and accidents told through years of Sherry’s Letters from Home column published in The Budget, the Amish newspaper. This delightful cookbook offers readers a faith-based, family-focused perspective of the simple way of life of the Plain People. It is truly a breath of fresh air from Sarasota, Florida! If you don’t do any cooking from scraps or scratch yet, don’t be daunted. We will take you through the steps you need to change from a throw-away kind of kitchen, to a kitchen that makes wholesome and “whole” foods. That's right, friends. Another cookbook to tickle your culinary fancies! I actually made a total of 3 things (technically) from this book and added a touch of my own. I thought the background information at the beginning of the book was very useful. I actually lived in Bradenton, FL, worked in Sarasota, and went to school in St. Petersburg for a few years and I honestly never would've guessed there was an Amish Mennonite community there. Sarasota is a very busy, expensive town where many travelers stop to buy high-priced items or bask on the Gulf Coast. It is not an area I would expect a community that thrives within (in comparison) simplicity to dwell. 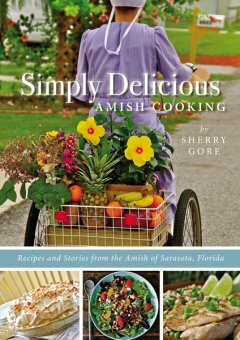 In the front of the book, Gore portrays the Amish Mennonite community for us, as well as The Budget newspaper in which she is a part. I thoroughly enjoyed this brief history and knowledge and thought it set the book apart from other cookbooks. As a whole, this book has some very delicious, hearty recipes that create pure, southern cooking. For the most part they were easy for me to follow, but some recipes didn't have exact measurements and that can stress a Type A person like me out a little bit! There were also a few recipes that seemed like they were modified repeats of others, and I think Miss Gore could've done without some of them. However, I found the individual stories included with each recipe endearing and heartfelt. It was like reading a cookbook and memoir in one. 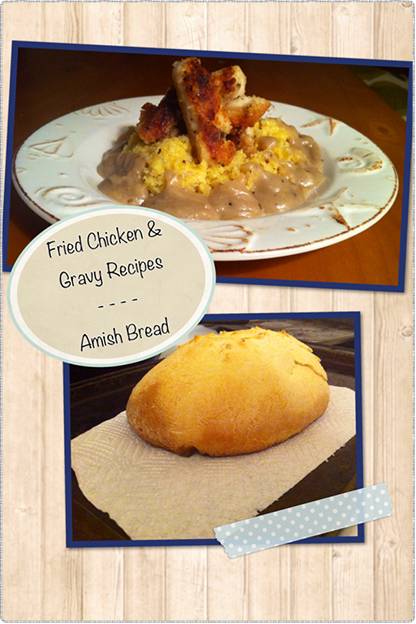 The recipes I chose were Lisa's Homemade White Bread, Fried Chicken, and Creamy Chicken Gravy. To complete the dish, we made some polenta which went fabulously with the chicken and gravy. This dish was really delicious and simple! Everything complimented the other nicely and I'm sure it would've been just as good with brown rice to substitute the polenta. I was actually really surprised how delicious the meal turned out regardless of the simplicity of the recipes and their ingredients. If you're partial to Amish cooking, I would recommend this book. The title describes it perfectly: simple and delicious! I received an eCopy, but rumor has it the printed version is in a spiral bounding, which makes it even easier to use in the kitchen! Please check out http://www.amishselections.com for more delicious Amish recipes and Amish products such as pins, dolls furniture, etc. All products that are for sale are made by the Amish community. Thanks and more power to you.